Origins of Pak Mei Kung Fu. Kung fu is a vast concept, encompassing a great many layers. On the simplest level, the term itself can be translated as “a skill accomplished through hard work”. Anyone with highly refined skill in any discipline is considered to “have kung fu”. Any professional athlete, musician, artist, etc would fall into this category. On a broader level, kung fu is a lifestyle; a code of ethics in which loyalty, discipline, honor and respect hold just as much importance as one’s physical ability. In Japanese disciplines, this is known as Budo. In all Chinese martial systems, this deeply engrained concept is known as Mo Duk or Martial Values. In adhering to this code, martial arts exponents seek to master themselves; not only physically, but also in the realms of morality, character, and overall self-improvement. In addition, kung fu fighting methods bring with them a great responsibility. A teacher gauges his students through Mo Duk. If the ethics of Mo Duk are absent and a student is void of morality, the school would be simply training their students in unadultered violence. Siu lam (shaolin) templehave been an ever-evolving force since their first inception. Military necessity, monastic traditions, and political influences have extensively influenced and transformed Chinese kung fu’s development over the centuries. Perhaps one of the most significant chapters in the growth of kung fu is its connection with Shaolin (Siu Lam in Cantonese) temple. Beginning with the Indian monk Bodhidharma's introduction of Chan Buddhism and preset health routines, evolving through Shaolin's own modifications, and most significantly to the creation of our system - through the chaos of the oppressive Ching Dynasty. Shaolin and the Ching occupation set the back-drop for the inception of Pak Mei kung fu. During the span of the Ching Dynasty (1644-1911), many anti-Ching patriots sought refuge at Shaolin temple. Many of these individuals were skilled martial artists had a tremendous influence on Shaolin techniques and vice versa. Of the many heroic and notable figures of this period were the Shaolin Five Ancestors. Each of these masters studied the methods of Shaolin kung fu, but were forced to flee the temple due to Ching aggression. They would disperse and go on to plant the seeds of reputable systems that are still being practiced today. The senior-most of the Five was named, Gee Sim. His lineage would go on to develop Hung Ga Kyun (Hung Family Fist). 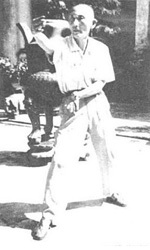 Ng Mui was the predecessor of the Wing Chun system (Eternal Spring). Fong Doe Duk & Mew Hing are rumored to have created their own styles, but there is little evidence to prove this. The second-most authority within the Five Ancestors’ group was named after his distinct white eyebrows. His name was Pak Mei (White Eyebrow) and the style he developed was known as Ngor Mei Siu Lam [*Siu Lam is Cantonese for “Shaolin”(Mandarin)]. After developing his skills in Shaolin, Pak Mei left the Temple and traveled to Ngor Mei Mountain, where he spent the rest of his life in relative seclusion – perfecting his fighting art. He chose to use “Siu Lam” in the title of his system as a tribute to the skills he’d previously acquired at the temple; as well as his Buddhist background. Mount Ngor Mei was known for its Taoist tradition; thus the title, Ngor Mei Siu Lam kung fu. While there are elements of all the typical Shaolin Five Animals in his new system (Dragon, Tiger, Leopard, Crane, Snake), Pak Mei's system would come to characteristically embody the ferocity and strength of the tiger, combined with the speed and sharpness of the leopard. Pak Mei had one disciple. He transmitted his refined style to the abbot of a Taoist temple on Mount Ngor Mei known as Gwong Wei. As a tribute to his master, Gwong Wei renamed the system from Ngor Mei Siu Lam kung fu to “Pak Mei Kung Fu”. Gwong Wei then passed his inheritance down to his disciple, monk Jok Fat Wan. From Jok Fat Wan, the art of Pak Mei Kung Fu was passed to Lin Sang and Cheung Lai Chun. Although Lin Sang was responsible for introducing Cheung Lai Chun to Jok Fat Wan, he himself had no heirs. However Cheung Lai Chun would bring Pak Mei kung fu out of the monastery and proceed to spread the system to many, including his last and youngest disciple, Master Kwong Man Fong. Prior to learning Pak Mei kung fu, Cheung Lai Chun was already a sifu in 3 styles: Lung Ying (Dragon Shape), Lee Ga (Lee family), and Lo Man Pai (Wanderers System). However, after a chance meeting/challenge with Jok Fat Wan’s student, Lin Sang, Master Cheung had quickly found that the skills of his three systems combined were no match for the system of Pak Mei. Cheung Lai Chun then pleaded with Lin Sang to teach him his style of kung fu. Refusal after refusal caused Cheung to devise a plan that involved meeting Jok Fat Wan himself. Cheung was eventually accepted as a student and would come to master the art of Pak Mei Kung Fu. Grandmaster Cheung Lai Chun began his Pak Mei training in the Gwong How Temple at the age of 24. The original system of Pak Mei contained four hand sets; Jik Bo Kyun 直步拳, Gau Bo Toi 九步推, Sup Baat Mor Kiu 十八魔橋, Mung Fu Chut Lam 猛虎出林; and the primary weapon set, Duet Ming Seung Gwai 奪命雙柺. However in time, Cheung began to integrate Pak Mei theory into select techniques from the earlier systems he’d mastered. This gives us the broad curriculum modern Pak Mei now contains; and the reasoning behind referring to Grandmaster Cheung Lai Chun as the founder of the modern day Pak Mei system. Grandmaster Cheung Lai Chun was undefeated throughout his martial arts career, was one of the 3 Tigers of the East River Region, and earned the title of The Seven Southern States Champion. He produced a multitude of students and many quality instructors. Among some of those students were the Chinese Nationalist soldiers he trained at the Wampoa Military Academy. In 1949, he moved to Hong Kong and in the Fall of 1964, Grandmaster Cheung Lai Chun died at the age of 84. Three of his four sons would come to carry on his tradition: Cheung Bing Sum, Cheung Bing Lam, and Cheung Bing Fatt. Bing Lam headed the Pak Mei organization until his passing in 2011. Bing Fatt, also deceased, was the second youngest son. Both Bing Lam and Bing Fatt had extraordinary Pak Mei skill.